Fiona in St. Mary’s Cemetery, goofy pose and all. I’ve mentioned before that Erick and I attempt to have a monthly “date” with each of our older girls. This has gotten a little trickier lately, because the girls are so close these days that they often don’t want time alone with Mommy or Daddy — they want their sister to come along, too. “I want to go to the ceremony,” she declared one day. And so I took Fiona on a Mommy Date to St. Mary’s Cemetery. 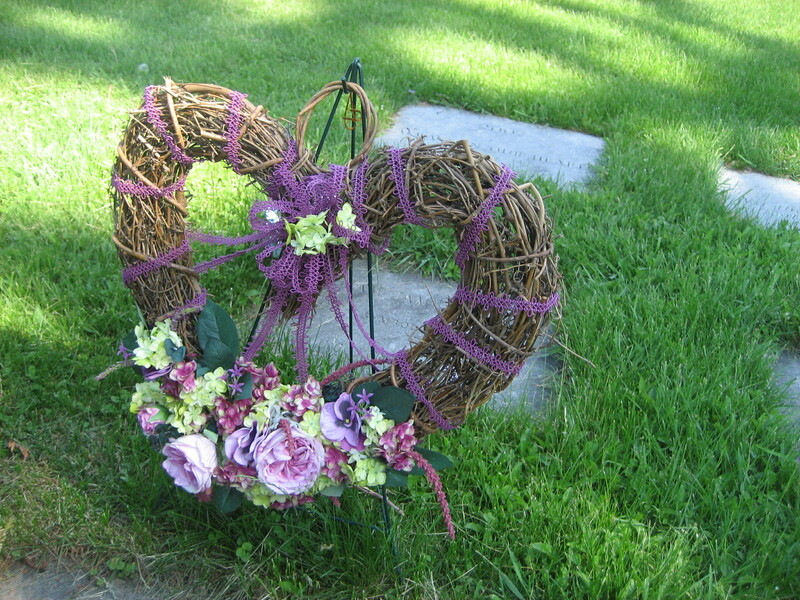 St. Mary’s Cemetery is one of about seven cemeteries in Middlebury. 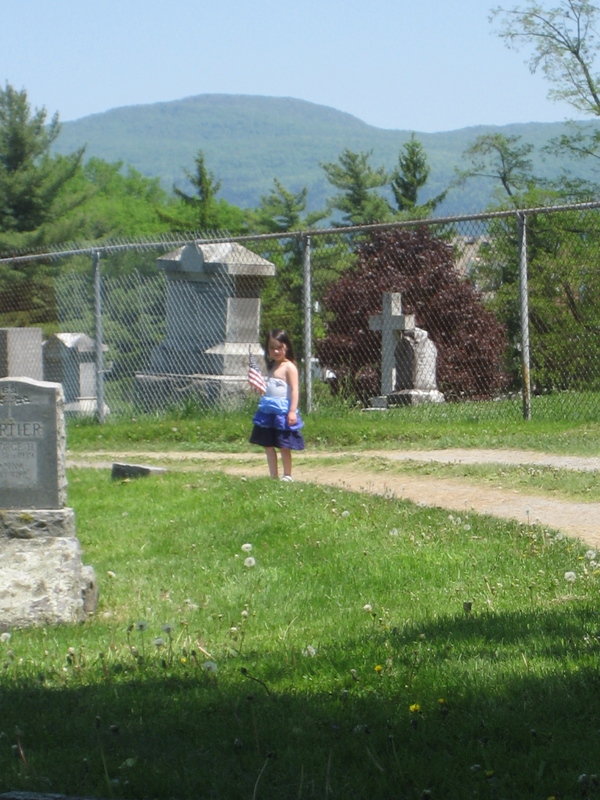 Compared to the more urban places we’ve lived, where cemeteries tend to be sprawling operations that still somehow stay tucked away out of sight, the Middlebury cemeteries are older, smaller, and much more visible — right next to the main roads, in many cases. 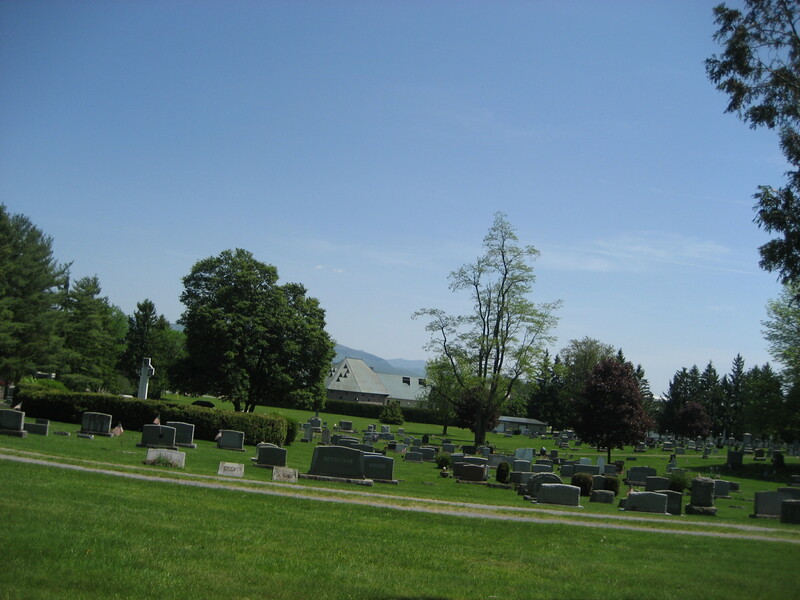 St. Mary’s Cemetery is directly adjacent to the Middlebury College campus, so Fiona had seen it numerous times during our walks and drives around campus. And, because she’d never seen a cemetery before, she was interested. 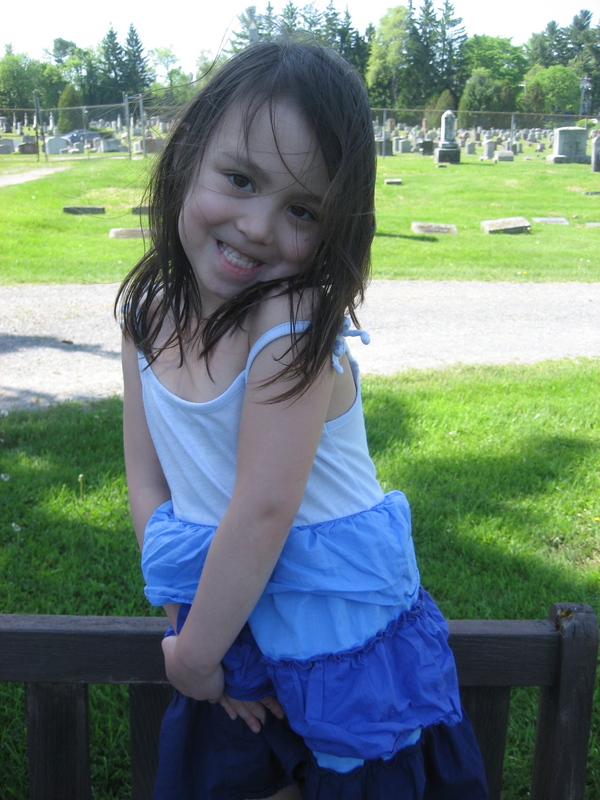 “What will we do on our Mommy Date to the cemetery?” I asked her that morning. I couldn’t argue with that kind of conviction, so that’s exactly what we did. 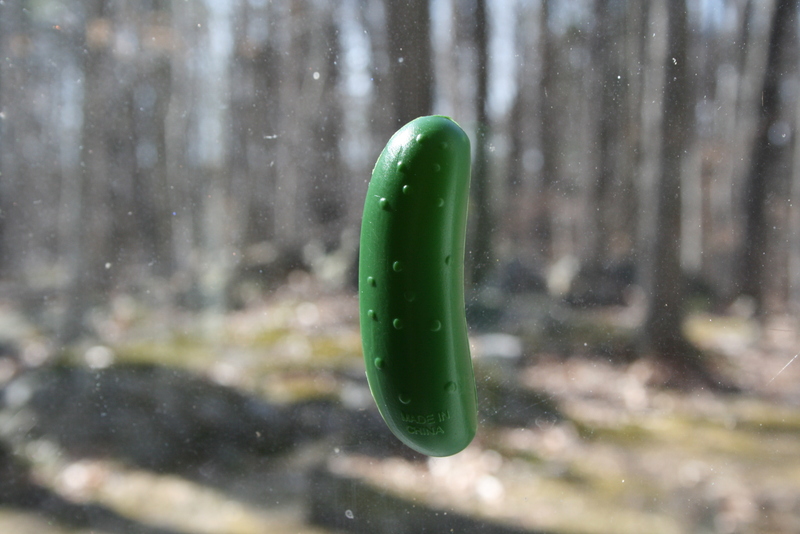 And it turned out to be the nicest afternoon I’ve spent in a long, long time. It was a gorgeous Sunday, with temperatures in the mid-80s. We parked on campus and walked through the cemetery’s front gate. During the almost two hours that we spent there, we were almost entirely alone. A few people stopped in to tend various gravesites, a woman walked her dog, and a handful of undergraduates jogged by. 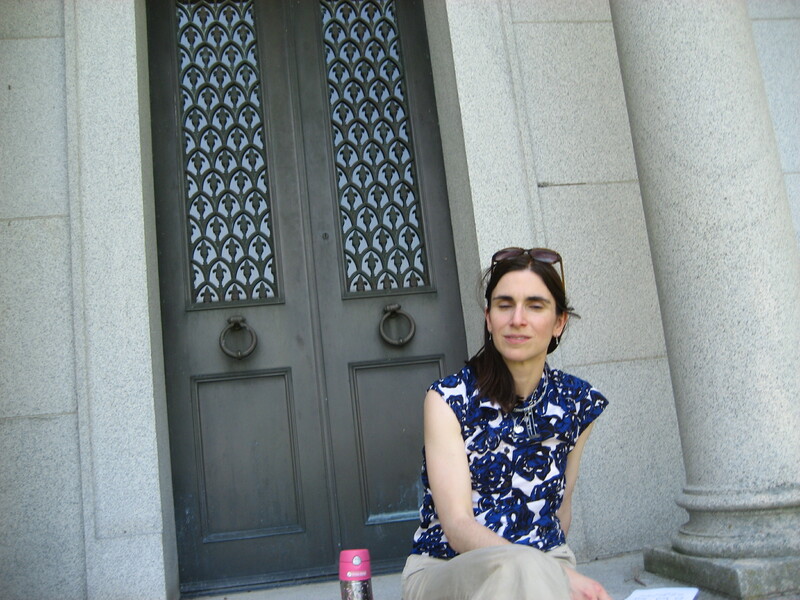 Unflattering photo of me on the steps of the Munroe family crypt, by Fiona. Fiona and I spent some time wandering among the headstones, and she asked me to tell her the stories of the ones she liked (mostly the ones with sparkly hearts carved into them). I’d forgotten how interesting graveyards can be. In St. Mary’s, there are plenty of brand new headstones, some still lacking an end date. But there are also some very old ones, dating back to the 1800s. It was fascinating to piece together the stories of these people, their family history, their relationships. Because this is a small town, we recognized many of the family names as belonging to people we currently know. 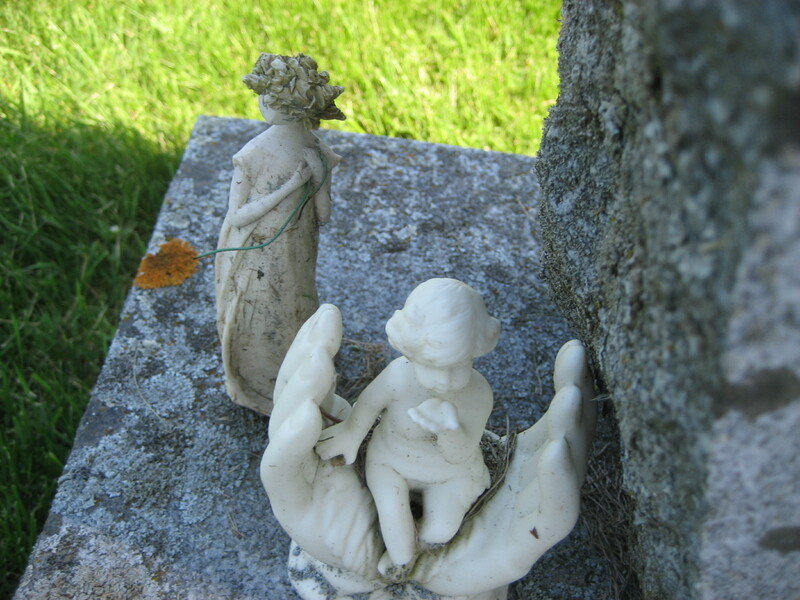 Of course, cemeteries can be poignant — even tragic. One particular family appeared to have lost three children, aged 20, 16, and 6, during a six-month period in 1824. 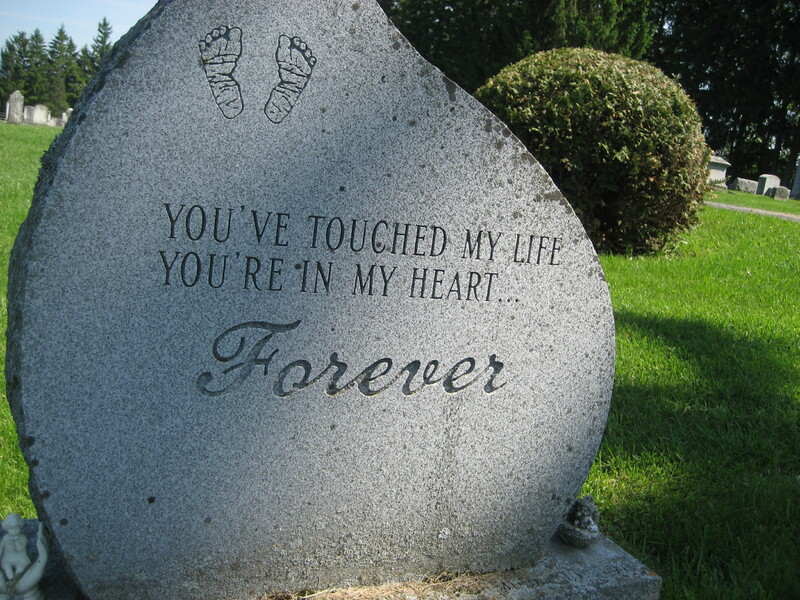 There’s even a section of the cemetery dedicated to miscarried babies. Because it was hot in the sun, after our initial wandering we sought out the shady places: first a low stone wall, where Fiona asked a lot of questions about cemeteries and burial and death while we watched a fat bumblebee in action; next, the steps of the Munroe family crypt, where we drew pictures with the markers and paper; and finally, a bench by the babies’ gravesite, where Fiona directed me in telling her a long, meandering, made-up fairytale. And since Fiona has recently discovered the joys of photography, I brought along our little camera so that she could snap pictures throughout the visit. That was it. Nothing profound; I didn’t come away with any new insights on life or death. I just learned that we don’t need to hide cemeteries, or be afraid of them; a cemetery was the perfect, peaceful place to spend an afternoon with my girl. Also, the post-cemetery ice cream was delicious.